California Rep. Eric Swalwell is not just a fresh-faced rising star in the Democratic party, he’s also one of the few high-profile liberal politicians who have showed a willingness to mix it up with the best conservative thinkers and arguments out there, as his multiple forays into the ideological lion’s den of Tucker Carlson Tonight attest. 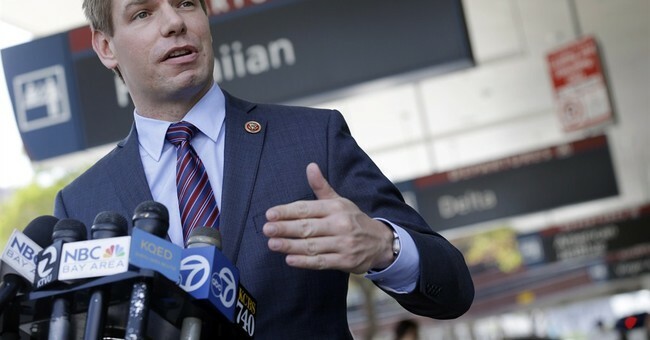 Sure, Swalwell almost always emerges from those battles bloody and bruised, figuratively speaking, but to his credit he takes his knocks and keeps on fighting, always willing to take on the ‘enemy’ on his own turf. For that, he has earned my grudging respect. Eric Swalwell may be a leftist and by definition insanely wrong on the majority of issues but at least he, unlike most, has the courage of his convictions and seems to genuinely believe his arguments will hold up against scrutiny. Which is why the California congressman’s weekend Twitter exchange with NRA spokeswoman Dana Loesch on the subject of assault weapons was particularly telling because of its abrupt, Swalwell-induced end. “Can you explain to me the difference between assault weapons and semi-automatic rifles? Is .223 ok but 30.06 not? Why?” asked Loesch. Unlike the first one, this apparently wasn’t a “fair question,” or at least it wasn’t one Swalwell was willing or presumably able to answer. And so the normally engaging and responsive California congressman remained silent. The lesson here, of course, is that gun controllers who know how to debate, as Swalwell does, will often attempt to seem friendly and ‘reasonable’ in their arguments. They’ll pick on the low-hanging fruit - those ‘scary assault weapons,’ for example - but will avoid letting the American public know their true intentions at all costs. That deer-hunting rifle hanging on your mantle may not be technically considered an ‘assault weapon’ right now, but if they’re able to ban semi-automatic “assault weapons” (their term) like the unfairly maligned AR-15, rest assured they’ll come for your deer rifle next. And when they have those, they won’t stop, because they never, ever do.